What have I learned living paycheck to paycheck. You have to be creative with budgeting. I'm not very good at budgeting. So I look for sales, coupons, and try new things. When we are low on funds we can't always afford Organic fruits and veggies. Of course, buy them Organic if you can afford it. When fruits and veggies are in season you can get good deals. I get excited when I see an apple sale for 99 cents a pound. That is a good price here in New York. It's also nice to see 2.99 for strawberries. Organic strawberries for around here are $5.99 per pound. We normally buy frozen veggies because they are a lot cheaper. I love fresh broccoli and asparagus. 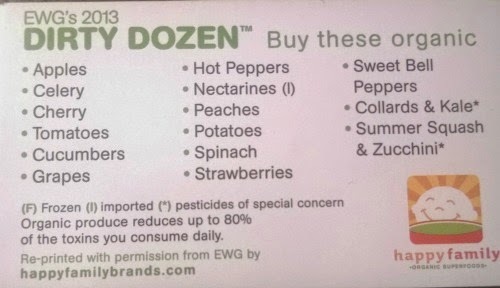 Look for Organic frozen fruits in your local grocery store. They would be great for making a smoothie. Many people say buy in bulk or buy from your local farmer. When living paycheck to paycheck it can be hard to buy in bulk. We can't just drop a few hundred on co-ops. It helps to get a group of friends who might want to join with you. Believe me, I want to buy Organic veggies from my local farmer every week. Carrots are available year-round. Plus they can last up to 2 weeks in the refrigerator. They aren't too expensive and can go with many different types of meals. You can roast, saute, and puree them. I love my carrots sweet with some butter and brown sugar. I know, that does not sound healthy but it is sure tasty. What are your favorite fruits and veggies? Do you have any money saving tips that you would like to share?